A major obstacle in math for many students with special needs is carrying in addition problems. Below is a task analysis approach. First, I target the step of identifying the ONES and TENS place in the 2 digit sum in the ONES column (below it is 12). In a scaffolded handout I create a box to for the sum with the ONES and TENS separated. At first I give the sum and simply have the student carry the one. Then I have the student find the sum and write it in the box (14 below). Once mastered I have the student write the sum and carry the 1. The last step is to add the TENS digits with the carried 1. I use Base 10 manipulatives to work through all the steps (larger space on the right is for the manipulatives) and have the student write out each step as it is completed with the manipulatives. Finally, the student attempts to add without the scaffolding. I continue with color but then fade it. 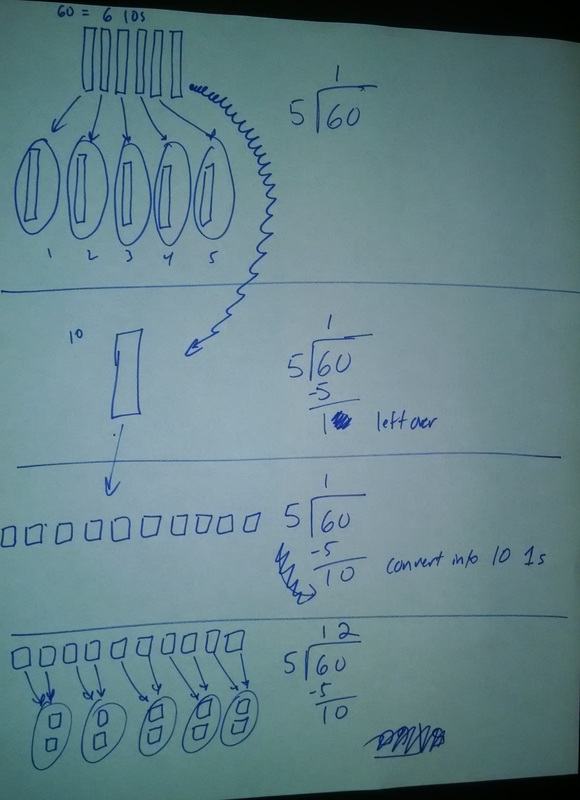 Here is an easy way to create and implement strategy to unpack place value for students (created by one of my former graduate students). I suggest using this after manipulatives and visual representations (drawing on paper) in a CRA sequence. It is hands on but it includes the symbolic representation (numbers). Hence is another step before jumping into the mathy stuff. The focus can shift to money as well. Use base ten blocks (and later with drawings as seen in the photo) and have students model each step of the long division with the base ten blocks. Do this for each step. See link to document with full explanation.